This simple but extremely fashionable costume will prove admirable for general wear in either city or country. It is illustrated serviceably developed in dark plaid cheviot with velvet of a harmonizing hue. The close-fitting Eton jacket is faultlessly adjusted and closed in double-breasted style to the neck with button-holes and bone buttons. It deepens to a point the center of the front and back and is distinguished by a stylish Robespierre collar. A convenient breast-pocket finished with a lap is inserted in the left front, and the close-fitting sleeves are completed with turn-back cuffs. The skirt is a seven-gored mode that flares decidedly at the foot and shows the fashionable dip at the top. It is fitted smoothly over the hips without the use of darts and has an under-folded box-plait at the back. Any of the tailored fabrics may be employed satisfactorily for the costume, with machine-stitching for the finish or self-strappings or braid for decoration. The jacket may be worn open if desired. The pattern, which is No. 4396 and costs 1s. 3d. or 30 cents, is in nine sizes for ladies from thirty to forty-six inches, bust measure, and is pictured differently on page 438. No. 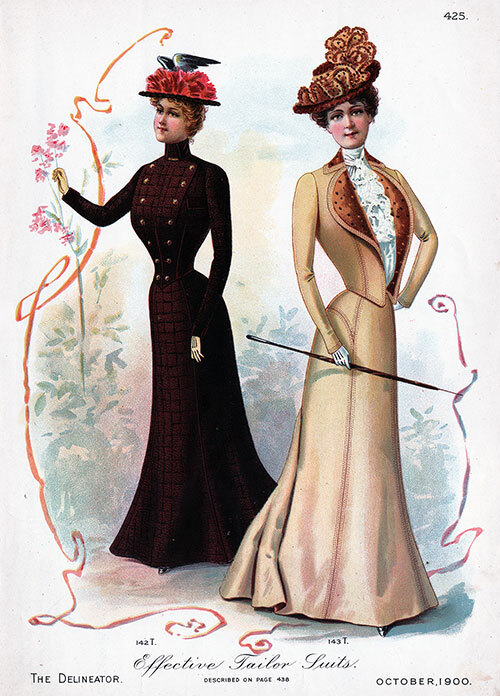 4396 Ladies’ Two-Piece Costume: consisting of an Eton Jacket to be made with a Standing or Robespierre Collar, and a Seven-Gored Flare Skirt to Be Made with The Conventional or A Decided Dip at the Top and in Round or Short-Sweep Length at the Bottom. Different representations of this stylish costume may be had by referring to figures Nos. 142 T and 148 T in this magazine. The two-piece costume remains in high esteem, no up-to-date woman now considering her wardrobe complete without at least one elegant tailored gown. For the present development of this original mode satin-faced gray cloth in one of the pastel tones was chosen with velvet for the collar and cuffs and machine- stitched strappings of the fabric for decoration. The Eton is carefully adjusted and shapes a point at the lower edge of the front and back. 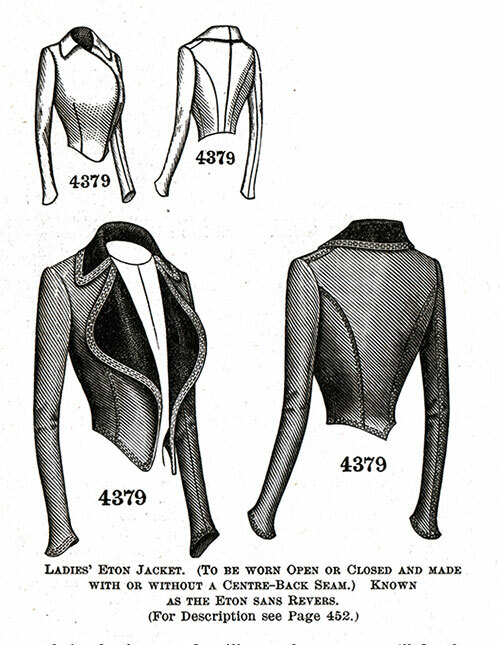 A shapely lap is joined to each front, and the closing of the jacket is made in a double-breasted style to the throat with buttons and button-holes, but, if liked, it may be worn open, and the fronts reversed to the lower edge. A breast pocket, covered with a lap, is inserted in the left front. A feature of the mode is the Robespierre collar, which may be replaced by a plain standing collar; the close-fitting sleeves are completed with turn-back cuffs. The skirt has seven gores, the shaping causing it to fit with sheath-like closeness to the knee, below which the seams are well sprung, producing a decided flare at the foot. 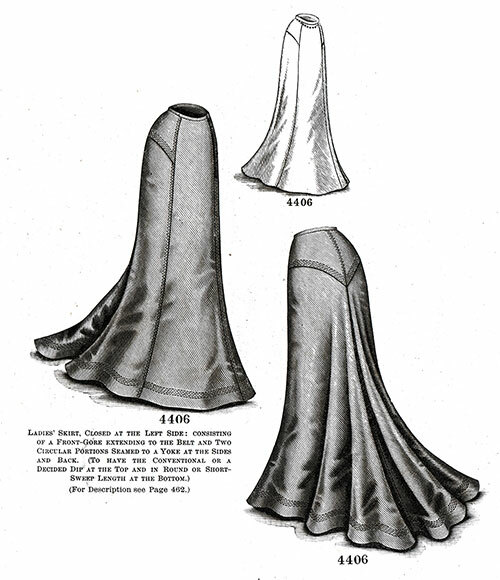 The design shows the popular dip at the top in front under the decree of Fashion, and in the medium sizes, the skirt falls in an outline of about three yards and three-fourths. The dip may be of the conventional order or very decided to give the graceful, long-waisted effect so pronounced a feature of this season’s current styles. At the back, the fullness is taken up in an under-folded box-plait, and the skirt may be in round or short-sweep length. A costume of this description could be reproduced in Venetian cloth with stitched strappings of the material as a decorative finish. A beige or tan fabric would be equally attractive with velvet or panne in a slightly darker shade for inlaying the collar and cuffs. We have pattern No. 4396 in nine sizes for ladies from thirty to forty-six inches, bust measure. To make the costume for a lady of medium size needs four yards and an eighth of fabric fifty-four inches wide with half a yard of velvet twenty inches wide, for the collar and cuffs. Price of pattern, 1s. 3d. or 30 cents. This combines a Ladies' jacket and skirt. A stylish modification in jackets, known as the Eton Sans Revers, forms part of this beautiful costume, which as illustrated, was developed in light smooth-faced cloth with embroidered panne velvet for facings and machine-stitching for the finish. The Eton is carefully adjusted and deepens to a point below the waist at the back and to give a long-waisted appearance at the front. A thick, rolling collar finishes the neck, and in this instance, the fronts are rolled back and allowed to flare stylishly. 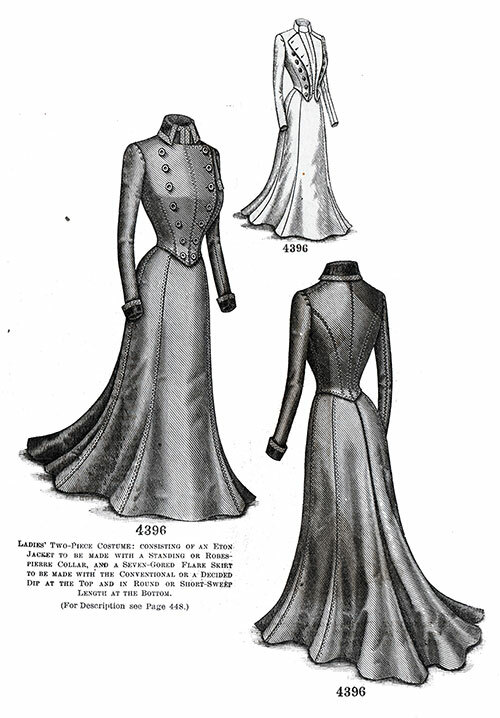 The close-fitting sleeves are bell-shaped at the bottom to flare over the hand. A novelty is presented in the skirt, which closes at the left side and flares stylishly toward the foot. The model consists of a front-gore that extends to the belt, and two circular portions seamed to a yoke at the sides and back. An under-folded box-plait disposes of fullness introduced below the yoke at the center of the back, and the design shows the popular dip at the top in front. Blue whipcord with facings of blue satin would develop a stylish toilette of this description. An inexpensive and serviceable development could be of homespun, tweed or cheviot. The jacket pattern, which is No. 4379 and costs 10d. or 20 cents, is in nine sizes for ladies from thirty to forty-six, bust measure, and is again portrayed on page 444. The skirt pattern, which is No. 4406 and costs 1s. or 25 cents, is in nine sizes from twenty to thirty-six inches, waist measure, and may be seen differently developed on page 456. No. 4379 Ladies’ Eton Jacket. Known as the Eton sans Revers. To be worn Open or Closed and made with or without a Centre-Back Seam. A different view of this jacket may be obtained by referring to figure No. 143 T in this number of The Delineator. Eton jackets are as fashionable as ever, and a particularly stylish one known as the Eton Sans Revers as illustrated was developed in a vibrant shade of blue broadcloth combined with a deeper shade of blue panne, stitched strappings of the cloth supplying a tailored finish. The garment is adjusted faultlessly by single bust darts and wide side-back gores and may have the fronts lapped broadly to the top and closed or worn open and softly rolled. The back may be made with or without a center seam and straight-across at the waist or extended in a point at the center, according to individual preference. The jacket shows the popular dip in front, and a deep rolling collar completes the neck. The sleeves are of the comfortable two-seam variety and bell stylishly over the hand. A serviceable light-weight jacket could be developed in gray whipcord, having the collar and the reversed portions faced with black satin machine-stitched. Covert cloth, homespun and Oxford suiting are also suitable. We have pattern No. 4379 in nine sizes for ladies from thirty to forty-six inches, bust measure. To make the jacket for a lady of medium size needs a yard and five-eighths of material fifty-four inches wide with three-fourths of a yard of velvet twenty inches wide to cover the collar and reversed portions of the fronts. Price of pattern, 10d. or 20 cents. No. 4406 Ladies' Skirt, Closed at the Left Side: consisting of a Front-Gore extending to the Belt and Two Circular portions Seamed to a Yoke at the Sides and Back. To have the Conventional or a Decided Dip at the Top and in Round or Short- Sweep Length at the Bottom. This skirt is shown differently made up in figures Nos. 143 T, 152 T and 163 T in this number of The Delineator. The sheath-like adjustment over the hips and the dip at the top of the front are points of interest in the skirt here shown made of gray cloth, finished with rows of machine stitching, and closed above the left side-front seam. The skirt includes a front-gore that extends to the belt and two circular sections that are joined to a smooth yoke and have their fullness at the back laid in an under-folded box-plait. The yoke shapes a point at the lower edge of the back and each lower front corner, and the dip may be slight or very decided, as preferred. The mode may be in round or short-sweep length and ripples attractively toward the foot, wherein the medium sizes the skirt measures about three yards and one-half. Broadcloth. Venetian or covert cloth, serge, Cheviot, and all tailored fabrics, as well as vailing, cashmere, etamine, drap d’été, etc., are suitable for the development of the mode. We have pattern No. 4406 in nine sizes for ladies from twenty to thirty-six inches waist, or thirty-seven to fifty- eight and a half inches hip measure. To make the skirt for a lady of twenty-four inches waist or forty-one inches hip needs three yards and one-half of fabric fifty inches wide. Price of pattern, Is. or 25 cents. "Descriptions of Figures in Colors, Tints, Etc., Shown on First Page of Cover and Pages 423 to 437 Inclusive," in The Delineator: An Illustrated Magazine of Literature and Fashion, Paris-London-New York: The Butterick Publishing Co. Ltd., Vol. LVI, No. 4, October 1900, Front Cover, p. 425, 438, 444, 448, 452, 456, 462. Editor's Note: Some terminology used in the description of women's clothing during the 1800s and early 1900s has been changed to reflect more modern terms. For example, a women's "Toilette" -- a form of costume or outfit has an entirely different common meaning in the 21st century. Typical terms applied to "toilette" include outfit, ensemble, or costume, depending on context.